I spotted this around Nørreport metro station. 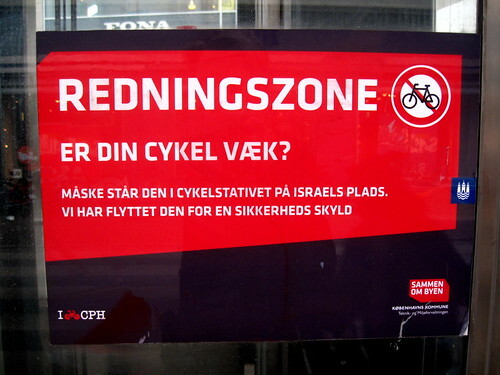 A sign from the City of Copenhagen. The train and metro station are the busiest in the nation. This is, apparently, a rescue zone in case of an accident. Maybe it's in the bike rack on Israel's Square. I like the gentle, helpful tone. What a nice sign. The City moves bicycles a hundred metres away to a large bike rack on the nearby square so that the rescue zone is kept clear and they let you know where you can, perhaps, find it.